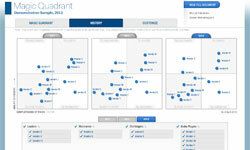 Vendors are eager to be included in Gartner Magic Quadrant (MQ) research. It is one of the most prominent artifacts in the technology analyst industry that IT organizations use to assess vendors for potential investment opportunities. Being in the Magic Quadrant has become increasingly important to vendors because IT organizations use it as a way to identify leading vendors in specific IT sectors. Inclusion in the MQ means that a vendor is more likely to be on the short-list of an IT organization’s evaluation process and can often elevate the vendor’s status in the market and boost their end-user business. Graphical positioning of competing technology and service providers. Depiction of markets in the middle stages of their life cycle. 15 weighted criteria that plots competitors based on their relative strengths in a market. Inclusion of vendors based on revenue, market share, target market, number of customers and type of products and services among other criteria. Assistance to clients with planning, investment decision making, and vendor relationship support. Leaders typically score higher on both criteria, and are usually large mature businesses. They are positioned well for the future, and execute well against the current vision. Challengers are believed to score high on the ability to execute but lower on completeness of vision. These are typically larger businesses that may have minimal plans for the specific industry. They often dominate a large segment and execute well, but do not often show an insight into the direction of the market. Visionaries often have scored lower on the ability to execute and have higher scores for completeness of vision, and are often smaller businesses. They understand the direction the market is going, and have a vision for the changing market. Niche Players are thought to score low on both criteria and are often new additions to the MQ. They are successful focusing on a small segment, or do not outperform others and may be un-focused. There have been recent features added that have resulted in the Gartner tool becoming even more functional than before. Enhancements include a fully interactive experience which allows customers to customize the evaluation criteria they wish to use. Clients and organizations can compare current and previously published MQs to evaluate market or vendor changes over time and assists organizations to select vendors that are most relevant to their business needs. Interactive capability also allows clients to model various scenarios for a specific view of the market. Analyzed markets include BI or business intelligence platforms, data integration tools, enterprise content management, customer service contact centers, and cloud computing, among many other sectors. Clients and organizations use Magic Quadrants as an initial step to gaining a comprehensive understanding of the technology vendors they may choose to evaluate for a particular investment opportunity. MQs deliver the insight necessary to assist clients in making informed decisions, and provides a research process that turns complex data into information that is clear, concise, and insightful.